A Marine widow and son got an extra blessing after the untimely death of her husband last month. At a recent Houston Texans game, Sara Wood and 5-year-old Landon were told they would be surprised with a gift basket, but something even bigger came their way. According to a local Houston newspaper, they were given a brand new four-bedroom house! Scott Wood died at Sara's parents' house on Nov. 20. He was a Marine that served in Afghanistan and Iraq. He probably died from complications with medication he had been taken since he was injured n Iraq in 2006. Scott never missed a Texans game and was buried wearing an Andre Johnson jersey. The nonprofit organization Bay Area Builders Association Support Our Troops (BABASOT) under its program Operation Finally Home contacted Wood, who's also an ex-Marine, and invited her to the Texans game for the surprise. 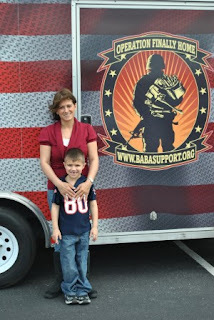 BABASOT builds mortgage-free homes for wounded soldiers or their surviving spouses at no cost. So far, the organization has partnered with builders to construct 32 houses across the country. Other sponsors for the Wood home include the Texans, who will decorate Landon's room, the Marine Corps League Galveston and Barbed Rose Steakhouse and Seafood restaurant. This makes for a nice story just in time for the holidays, don't you think?